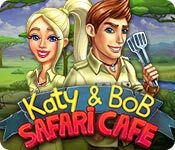 Katy and Bob: Safari Cafe is rated 4.1 out of 5 by 7. Rated 5 out of 5 by Csgentry from Fun Game! I am really enjoying this TM game. I haven't finished it yet, but so far it is fun and fast paced, but not too hard. Rated 5 out of 5 by 2020moonlanding from I'd like a hamburger and icy orange juice please... This is an outstanding TM game. To start with the dialogue is captured in comic book style with wonderful graphics and conversation that pulls you into the storyline from the start. 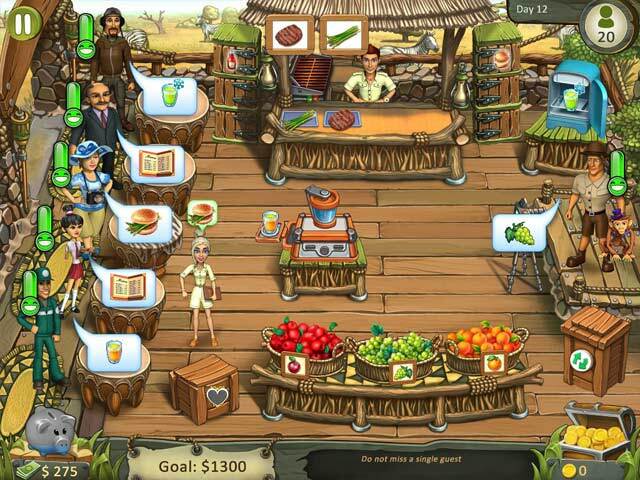 The Safari Cafe is charming where there is a long stream of hungry customers who want to be served in a timely manner. The music and sound effects are spot on adding charm to the safari atmosphere. I only wish there was a relax mode as the customers leave if they are not served quickly leaving me a bit manic. Rated 4 out of 5 by mez3 from ok its a good game but not challenging enough for me. Rated 4 out of 5 by jskalb from Not as fun as Katy and Bob: Way Back Home Seemed slower than the one above and mentioned below. The other two have great pace. Not as fun as Katy and Bob: Cake Café. Loved the other two. Can play them over and over and over. Rated 4 out of 5 by keegan12 from Fun game This was a fun game to play but I did not find it that challenging. It was fairly repetitive so it was easy to get the pattern down. The cafes were all basically the same and there were new products added from time to time. I like things that are a little harder. Rated 4 out of 5 by pennmom36 from THIS KITCHEN'S GETTING HOT! I love dinner dash type Time Management games, and although this game doesn't have as much appeal as the original Katy and Bob, it's still a fantastic game. I love the fact that I don't have to click and drag people to their seats etc, it's just a point and click style game. I'm not a fan of paying twice as much for a Collector's Edition version of a Time Management game, and I don't think you'll miss what's missing in this Standard Edition version. The only thing you get with the CE version, is 10 Concept Art pictures that are very cartoonish, 5 downloadable Music Soundtracks, 12 Trophies to earn for hitting milestones, and 10 Bonus Levels. Katy & Bob are siblings who have a rich daddy. The dynamic duo are offered the opportunity to get in on the ground floor, of opening up several cafe's in the expanding Safari Park. Daddy thinks this is a great business adventure so they open the first of three cafe's. The graphics and game mechanics are way better than the original Katy & Bob: Way Back Home, which was released in 2012, but after revisiting the original, I found that game to have more appeal. This is a point and click TM style game, where you click the customer to give them a menu first, and then click on the item they order, deliver the order and click to check them out. You don't have to drag anybody or anything (a feature I really find annoying) After checking the customers out, they leave you a tip that requires another click, or you can scan over the coins to receive your tip. The slower you are at doing these tasks, directly affects the tip, with gold, silver or bronze coins earned. The "expert" goal amount is shown before the start of each level, and there are Bonus Goals available (but not required) which are shown at the bottom, such as collecting money from three consecutive customers. As you progress, the menu items increase, and more combo's are orders. a customer may want a steak, or a steak burger with veggies, and or condiments. There are three different fruits available, apples, oranges and grapes. Some customers want fresh squeezed juice which requires you to place the correct fruit in the juicer before serving. If they want it frozen, you have to take the fresh squeezed fruit drink into the freeze machine and wait until it freezes before serving. After each level, you can use the money you earn to buy items or upgrades from the shop. You can buy extra serving stations, increase the price of items or upgrade flooring etc. to keep customers happier longer. 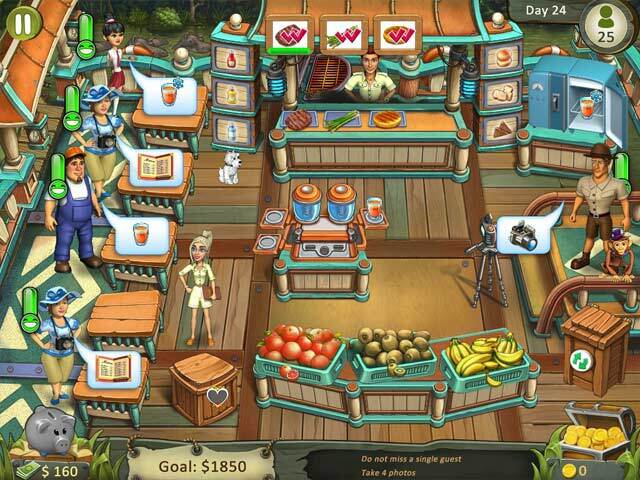 Eventually, you will unlock the Antique Shop, at specific levels, that allows you to buy artifacts that speed up service, give the customers a better disposition, or make them more patient for longer times for example. 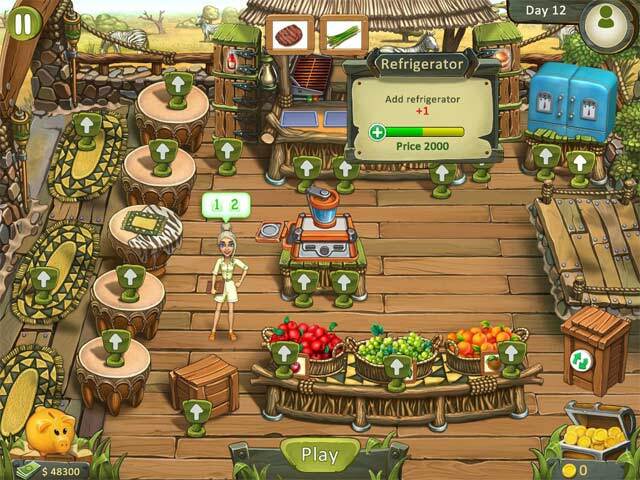 If you love dinner dash type Time Management games as much as I do, I think you'll love Katy and Bob, especially if you like Safari themed games. You should also give the original Katie and Bob a try, enjoy!